Belmont has joined the many communities in London which have an Eruv. Its boundaries take it from Canons Park Station on Whitchurch Lane, along the Jubilee line for about a mile. It then turns west, crossing Kenton Lane until it reaches Kenmore Avenue. It then turns north until it reaches the Uxbridge Road. The Belmont Eruv takes in at least 4,000 homes. 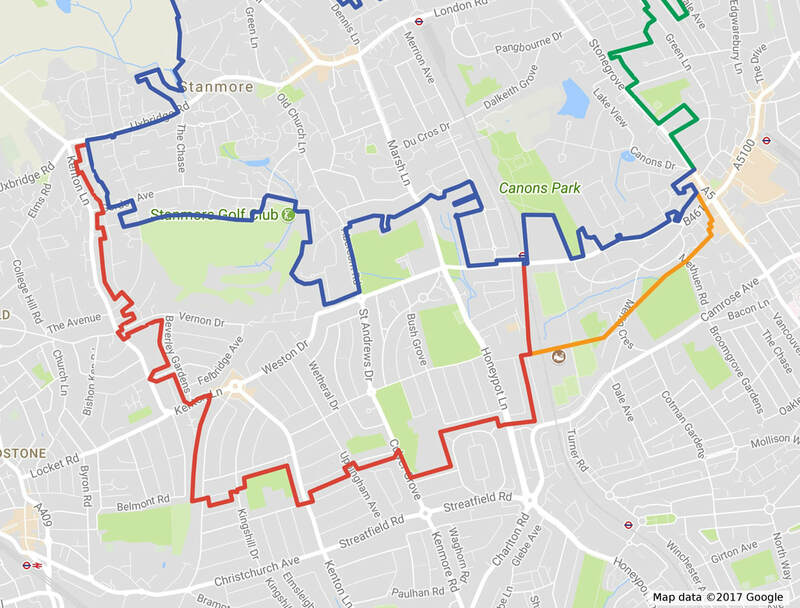 The area covered by the Belmont Eruv is shown in the map below (the blue and green lines are the boundaries of the Stanmore and Canons Park Eruv and the red line is the boundary of the Belmont Eruv and the orange line the boundary of the extension. If you are thinking of moving to Belmont we look forward to you joining us. To check whether your proposed new home will be inside the Belmont Eruv please contact Rabbi Levene at rabbi@belmontus.org.uk or 07989 538525. The Belmont Eruv is inspected each week. Anyone who wishes to use the Belmont Eruv must ensure every Friday that the Belmont Eruv has been declared operational by checking this website. You should not assume that the Belmont Eruv is operational. If you want to know more about the Belmont Eruv please take a look at our answers to the frequently asked questions using the menu above. The community has completed a further extension of the Eruv, running down to the east end of Whitchurch Lane as far as Montgomery Road. This takes in a further 500 or so homes, including Whitchurch Gardens, Stratton Close, all of Whitchurch Lane, down to Montgomery Road and part of the Buckingham Road estate. The extension is shown by the orange line in the map below and is operational from 19 January.